I was extremely excited all day yesterday for WWE Raw for two reasons – first, the show was being highlighted by previously announced segments such as the debut of Bray Wyatt and The Wyatt Family and Vince McMahon, Stephanie McMahon and Triple H all conducting a job evaluation of Raw Managing Supervisor Vickie Guerrero and second, the show was taking place in Baltimore and I was going to be there live with my friend Johnny! While I haven’t had a chance to watch the show on my TV, I’ve always said there is nothing like being at a wrestling event live and even the worst shows can be made 10 times better by being there in person. With that being said, however, between the two aforementioned segments and two great matches that opened and closed the show, I thought that last night’s episode of WWE Raw a great one and a solid way to send us into the Money In The Bank pay-per-view on Sunday. As the title to this posts notes, last night’s show was bookended by two incredible wrestling matches. The first match of the night was Daniel Bryan vs. Sheamus and it was an incredible way to kick off the show. The match itself was one of the best I’ve seen live at a television taping (read: non-PPV) in a long time, the crowd was hot and Daniel Bryan might just be the over WWE Superstar on the roster today. The match, which must have lasted 15-20 minutes, ended when Bryan countered the Irish Cloverleaf with a roll-up for the clean pin and the win. The last match of the night was Randy Orton vs. CM Punk, which once again had the crowd on their feet with half chanting for each Superstar. This match also lasted about 15-20 minute and was a great technical wrestling match which CM Punk won in the end with a clean pin after hitting the Go To Sleep. 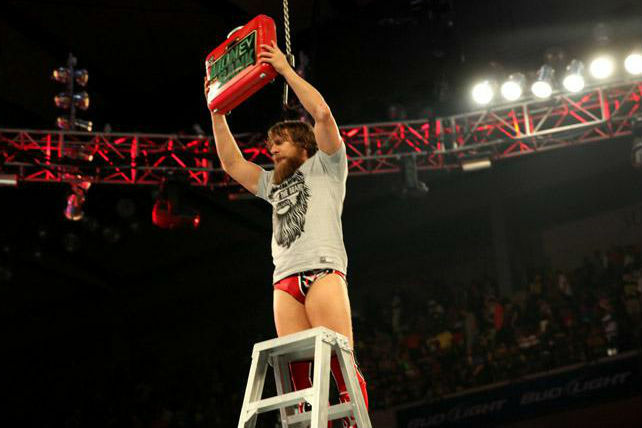 After the match, Bryan hit the rind and threw Punk out of it, then got a ladder and climbed to the top where he retrieved the MIT briefcase and held it high above his head as Raw went off the air. Last night also featured the debut of Bray Wyatt and The Wyatt Family. Now I complain about the WWE product and the direction of some of their storylines and character developments quite often, but I always give credit where credit is due and credit is certainly due with the hype and promotion built up prior to this debut last night. The promo videos shown each week are unlike anything I’ve seen from the company before (and frankly, downright creepy) and they culminated in a series of videos last night showing a reporter tracking The Wyatt Family down in Louisiana. After a match between Kane and Christian, which Kane won with a chokeslam, the lights went out and the final Wyatt Family video of the night was shown. As the crowd rose to their feet, the lights went out and Bray Wyatt, Erick Rowan and Luke Harper made their way down the ramp, lit only by a small lantern. After Wyatt blew out the lantern, the lights came back on and Rowan and Harper hit the ring and attacked Kane while Wyatt watched from a rocking chair on the ramp. Rowan and Harper proceeded to decimate Kane, even going as far as smashing his head between two sets of steel steps. 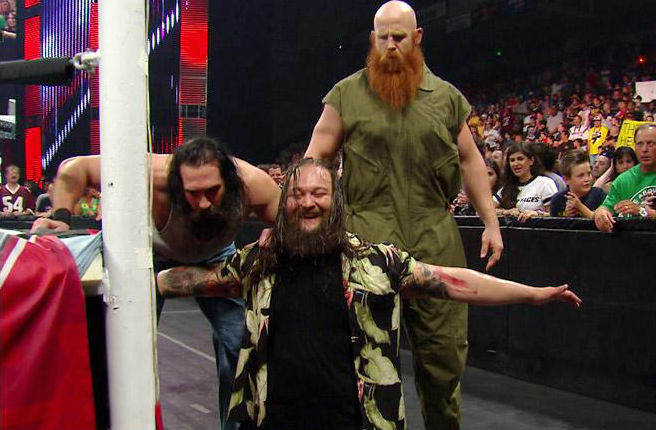 After the attack, the Wyatt Family stood over Kane’s body before heading back up the ramp as medical personnel strapped Kane to a backboard and carried him backstage. As I said last night, the debut could have been a little better but it also could have been WAY worse (e.g., the inauspicious debut of Brodus Clay). By taking out Kane, a seasoned veteran, a monster by character and a large man in general, the Wyatt Family showed their power and dominance right off the bat. Plus, Kane was supposed to be one of the participants in the MITB All-Stars match on Sunday, so the attack raises questions as to his participation in the match and whether or not a replacement will be named. Plus, by attacking Kane and then leaving without cutting a promo, it wets our appetite for more and will have us tuning in next week and beyond to see what they will do next. Plus, the entrance itself with the dark arena and the small lantern looked cool in person so I imagine it looked even closer on TV with the benefit of a close angle view and HDTV. As for the Baltimore crowd, we collectively held our breaths every time one of the videos played and we were on our feet from the moment they stepped out onto the stage to the moment they left the arena, cheering the entire time. What I will say, however, is that I thought the “Husky Harris” chant was a real shame as the WWE has worked real hard to build up an interesting and unique character and a chant like that following Bray Wyatt from arena to arena will only hurt him going forward. The other highlight of the night was the job evaluation of Vickie Guerrero by Vince McMahon, Stephanie McMahon and Triple H as the power struggle between Vince and HHH continued with Stephanie in the middle between her father and husband. I have no idea how the segment played on TV and for all I know it was boring to the fans at home but personally I will never get tired of seeing the McMahon family in the ring live, plus I happened to think the segment was very well done. The power struggle played great, Stephanie played her role perfectly and in the end she let the fan poll decide Vickie’s fate, which of course led to her being fired. Irate at the decision, Vince declared that he was going to give the fans exactly what they deserve and named Brad Maddox as the new Raw GM. So, at the very least, that should be interesting and I’m sure we haven’t seen the last of Vickie Guerrero. WWE Raw kicked off with Vickie Guerrero and Brad Maddox already in the ring (what happened to kicking off the show with fireworks?) with a ladder already set up and the WWE Championship Money In The Bank briefcase hanging high overhead. Vickie noted that she had worked hard to climb to the top of the ladder in a male dominated profession and punctuated her point by climbing to the top of the ladder. As the crowd chanted to the referees holding the ladder steady to “tip her over,” Vickie continued that everything she had some while in charge of Raw had been for the fans and she hoped that the McMahon family would see that and promote her to permanent General Manager. Jerry Lawler then got on the microphone and announced that word had come from the back that the fans could vote on her job performance, with a choice of pass or fail, on the WWE app. Vickie then kisses up to the crowd and announces that six of the seven MITB all-stars will compete in the aforementioned singles matches plus Mark Henry and WWE Champion John Cena would be face-to-face in the ring. The segment between Henry and Cena was short but sweet and ended in the best way that it could given how I feel about Cena and especially how I feel about seeing him live – with Mark Henry picking him up and laying him out with the World’s Strongest Slam. Later in the night, after Raw went off the air, we were treated to a WWE Championship tables match between Cena and Ryback, which Cena obviously won when he put Ryback through a table with an Attitude Adjustment. The issues between Dolph Ziggler and Divas Champion AJ Lee continued to bubble just under the surface as Ziggler found AJ backstage and chided her for following Kaitlyn around and playing mind games with her when her focus should be retaining her title and helping him to win the World Heavyweight Championship at MITB on Sunday so they could walk down the ramp together both as champions. Later in the night, Ziggler interrupted a match between World Heavyweight Champion Alberto Del Rio and Sin Cara (which ended in a no contest when Del Rio went to attack Ziggler on the ramp). As for AJ, she was in a tag team match with Alicia Fox against Kaitlyn and Layla which also ended in a no contest when Kaitlyn speared the you-know-what out of AJ outside the ring. Intercontinental Champion Curtis Axel (accompanied by Paul Heyman sporting a black eye from the attack on Smackdown last week) took on Chris Jericho in a match that saw Axel suffer his first defeat since teaming up with Heyman, although the loss did come as the result of The Miz distracting Axel during the match. Tons of Funk (Brodus Clay & Tensa) lost to Tag Team Champions Seth Rollins & Roman Reigns (The Shield) in a quick match. Surprisingly, United States Champion Dean Ambrose was nowhere to be seen all night, even in a backstage segment featuring all of the other participants in the WHC MITB match. As a side note, the biggest pop of the night from the Baltimore crowd was when Super Bowl Champion and Baltimore Ravens running back Ray Rice was shown on the TitanTron. It was also cool earlier in the night when Baltimore Orioles centerfielder and 2013 All-Star Adam Jones tweeted a picture of himself with the WWE Championship belt. 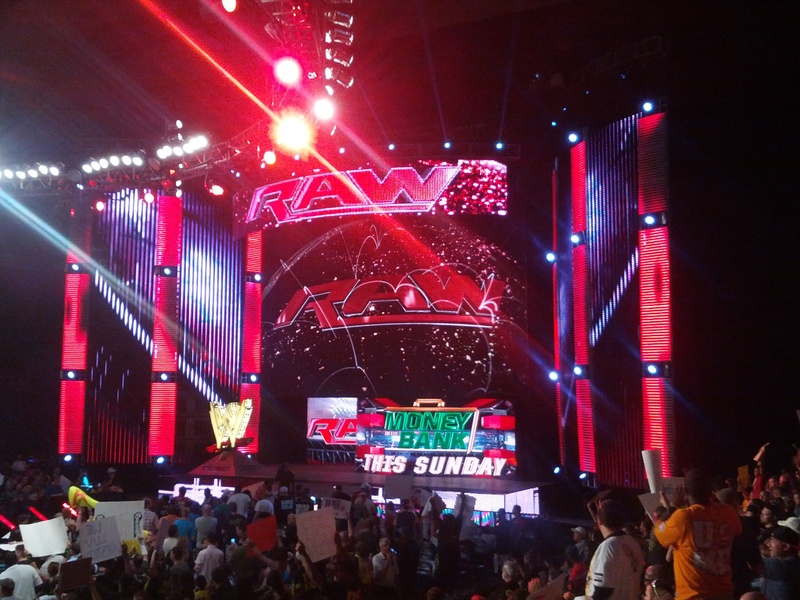 Click here to view the photos I took at WWE Raw live in Baltimore last night. I am what you call a WWE Super Fan. I have been a fan since 1991, when I was 10 years old, with the first pay-per-view I ever saw being Survivor Series of that year when The Undertaker made his debut. From that moment I was hooked and I never looked back. Now, over 20 years later, I watch Raw and Smackdown every week, I attend nearly every pay-per-view that comes to Baltimore and I travel fairly extensively for live shows, including every Wrestlemania 18 and then every one since Wrestlemania 23. But, despite being a Super Fan, I am still critical of the product and, like many fans, feel I could turn things around in less than a year if they would hire me as a member of the creative team. So this that won't happen, this blog was born instead. This entry was posted in WWE, WWE Raw and tagged Adam Jones, AJ Lee, Alberto Del Rio, Alicia Fox, Baltimore, Baltimore Orioles, Baltimore Ravens, Brad Maddox, Bray Wyatt, Brodus Clay, Chris Jericho, Christian, CM Punk, Curtis Axel, Daniel Bryan, Divas Champiom, Dolph Ziggler, Erick Rowan, HHH, Husky Harris, Intercontinental Champion, Jerry Lawler, John Cena, Kaitlyn, Kane, Layla, Luke Harper, Mark Henry, MITB, Money In The Bank, Paul Heyman, Randy Orton, Raw, Ray Rice, Roman Reigns, Ryback, Seth Rollins, Sheamus, Sin Cara, Smackdown, Stephanie McMahon, Super Bowl, Tag Team Champions, Tensai, The Miz, The Shield, The Wyatt Family, Tons of Funk, Triple H, United States Champion Dean Ambrose, Vickie Guerrero, Vince McMahon, World Heavyweight Champion, World Wrestling Entertainment, wrestling, WWE, WWE Champion. Bookmark the permalink.